Here I'll discuss about a theoretically interesting scientific provocation made by the russian scientist V. Y. Argonov regarding the possibility to conceptualize Consciousness as a function of eigen and superposition-states of electrons, without necessity of a Bose-Einstein condensate and without assuming the existence of a unified cluster of neurons like in others Quantum Mechanics theories of Consciousness. Until a few decades ago, Consciousness was not deemed as a suitable subject of scientific investigation. It seemed too elusive and too related to metaphysical concepts to be able to be studied through the methods and the control procedures in use in science. Since the '80s, however, dizzying advances in neuroscience have led an increasing number of experimental confirmations about the link between brain processes and mental phenomena. Acquired thus a strong physiological basis of reference, the investigation into Consciousness has ceased to be considered a pure philosophical speculation subject, to enter more fully into the field of scientific research. Theories proposed in recent decades about Consciousness ranging from theories based on classical physics (such as ones by Paul Churchland, Antonio Damasio, Daniel Dennett, Gerald Edelman, Francisco Varela and John Searle) to the latest generation theories based on the principles of Quantum Mechanics and, more precisely, based on the concepts of wave-particle duality, wave function collapse, retrocausality, non-locality and unified field (for example, theories proposed by John Eccles, Stuart Hameroff, Roger Penrose and Chris King). Despite the progress achieved, a true understanding of mental phenomena appears still an achievement rather far. In this article, I will discuss about a provocative and theoretically interesting paper made by Victor Yu. Argonov in 2012. The aim of quantum theories of Consciousness can be essentially synthesized as a quantistic physics reply to the problem of the unity of consciousness in which a Bose-Einstein condensate state of materia (the so-called "fourth state" of materia) is assumpted as a theoretical stratagem in order to explain the unity of consciousness in time and space through the concept of a macroscopic quantum state which behaves like a super-particle of neurons synchronized each others. The Bose-Einstein condensate is a state of matter that is reached at extremely low temperatures. These condensates are extremely ordered structures: all the particles that make up the condensed behaves as if they were a single particle. A property of Bose-Einstein condensates is that they permits signal amplification and information encoding, elements that, according to Frohlich (1968), are the basis of Consciousness. The most famous hypothesis in the Quantum Neuroscience scenario is the one elaborated by Roger Penrose and Stuart Hameroff (Hameroff & Penrose, 1996; Hameroff, 2006). They conceptualized Consciousness as a network of neurons connected by gap junctions in order to realize a so-called syncytium: an "hyperneuron" with common cytoplasm and many nuclei. The studies conducted by Hameroff have shown that microtubules are the candidates to support the quantum processes of calculation and intracellular communication, that are very important for higher cognitive functions. It would be especially the activity of microtubules (and in particular the quantum phenomena inside them) that could be related to the emergence of consciousness (see again: Hameroff, 2006). Penrose & Hameroff Theory assumes that reality is composed of three worlds: the Platonic, the Physical and the Mental world. The authors suggests that these worlds are totally separated and that they interact each other through the wave function collapse. In quantum mechanics, wave function collapse indicates the state evolution of a physical system determined by the extent of its observable (a dynamic variable that can be measured). The concept was introduced by Werner Heisenberg in the uncertainty principle, while the mathematical formulation is due to John von Neumann. Penrose & Hameroff suggests that in the microtubules, tubulin structures that form the cytoskeleton of neurons, takes place every 25ms. the wave function collapse (OR) that produces a conscious experience, bringing the mental world to come in touch with the physical world. All wave function collapse considered together is the source of the stream of Consciousness that are quantum computation processes that are self-organized. According to the paper discussed here, Argonov argues that the main problem of this theory and, more in general, all the theories made in this direction is the inability to explain in rigorous terms the temporal unity and the indivisibility of Consciousness. Essentially, we know that all collective phenomenon could be divided into parts and quantum synchrony fails explaining which part will be "mine" after a disjunction. For example, if we consider split-brain patients, there is no explanation of which hemisphere would contain the original "self". Considering the Hameroff-Penrose model, we suppose many gap junctions close in deep sleep or anesthesia, but what happens with the "self" in these situations? Is it died or not? Which process keeps it alive without quantum coherence? Absurdly, assuming as true the model of neural network of quantum states synchronized (the "hyperneuron") we may assume that any split of our conscious structure kills original person, but this leads to a counter-intuitive conclusion that we die after any change in the synchronized network of neurons! Therefore, in order to overcome these kinds of theoretical and speculative problems, Argonov proposes a radical alternative in order to conceptualize Consciousness in a quantum mechanics way, without the necessity of a Bose-Einstein condensate and without assuming the existence of a unified cluster of neurons. In this direction and incorporating in a sense the ideas of Leibniz, he suggests that there is no unified "brain" or even "cell" consciousness, assuming that each electron (or even each fermion) has its own consciousness. Each electron in the universe is conscious, as a subjective "observer" of its quantum dynamics (energy, momentum, "shape" of wave function). Each electron "feels" its quantum dynamics as "own" subjective sensations and volition. In principle, the same may be true for all fermions. Most of electrons (or fermions) in the universe have primitive consciousnesses. Some particles in biological cells (especially in brain) have complex consciousnesses due to complex dynamics in complex organic environment. Animals are hierarchical structures of particles. Some chemically active electrons in animal brain are "on the top" of the hierarchy. Their dynamics is directly influenced by sensory data and has direct influence upon animals' behavior. In the paper, Argonov calls them "pontifical particles (PPs)". So-called "human mind" is actually mind of PP. In principle, there may be several PPs with synchronized dynamics in one brain. They "feel" the same and perform the same volitional acts. Principle "one human = one consciousness" is wrong. Human brain might have a lot of observers sharing similar "human" mind. Most of human intellectual functions are performed by classical mechanisms in neural network. PPs are responsible only for perception and the "final stage" of decision-making. The great significance of this theory is obvious: thus understood human consciousness does not end in the interaction between neurons of our brain, but it is a quantum information that can exist indefinitely outside the body. The possibility for a single electron to contain enough "data" (information) is fully discussed in the paper through the consideration that, considering the full wave function (so, considering both experimentally observable and unobservable variables) of the single electron, the amount of information that could be contained is at least 1012 bits and "this is obviously enough to encode human conscious experience at a given time moment". Temporal resolution is known and it is around 0.02 and 0.04 s.
So, we obtain as result of energy fluctuations of an electron at room temperature 0.025 eV. Therefore, electron might have 1012 subjectively distinguishable gradations of energy, each of which might correspond to different state of consciousness, but it's not enough to the "storage" of our real Consciousness. Argonov proposes to consider not only eigenstates but also superposition states of the electrons (experimentally unobservable variables): not a single value of energy (0.025 eV = 1012) but the total energy spectrum with 1012 gradations of energy. So, if pontifical particles (electrons) observes the sum of 1012 gradations of energy, then total information availability of its consciousness will be 1012 bits. In the brain, there is at least one pontifical cell (PC) or pontifical syncytium (PS, cluster of PC). There may be also a group of synchronized PCs. Each PC or PS integrates sensory data from perceptual systems. Each PC or PS contains a system of synchronized PPs. They may be located in voltage-gated ion channels (most likely, chemically active electrons in) or in microtubules. Some physiological mechanisms (most likely, electrical or quantum mechanisms) "distribute" sensory information through the membrane or cytoskeleton. These mechanisms influence on quantum dynamics of PPs in such way that sensory signals are directly "observed" by them. PPs are not just passive observers of sensory data. They play some non-trivial functional role in axonal impulse generation. Axonal impulses of PCs or PS cause volitional activity: speech, motion of hands, thinking, volitional usage of memory (stored in other cells) etc. 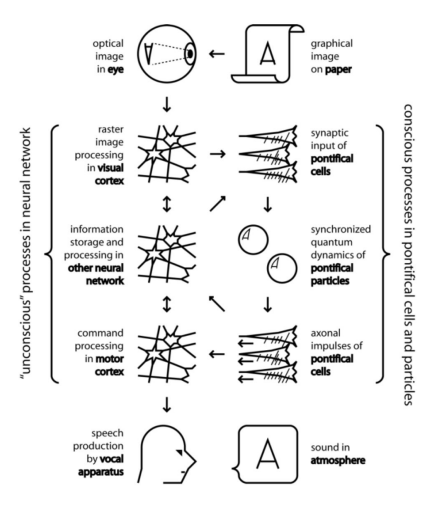 Significant part of information processing and storage is performed by classical neural mechanisms outside PCs or PS. Using the same words of Argonov, "if the hypothesis of single particle consciousness would be proven, it will make a huge impact not only on neuroscience, but also virtually on all branches of philosophy including ethics and religion. If our consciousnesses are 'attached' to single electrons, then our 'souls' are physical, but immortal. The death of the body does not cause the death of the observer. 'Self' remains alive; however, it loses memory and takes primitive form. If an animal would eat the pontifical particle (PP) from the dead body, then PP would have some small chance to be used in its brain. This would be a kind of reincarnation. In the future, nanotechnology may provide such reincarnation by artificial methods". Analyzing the quantum models of Consciousness, it is possible to find a tendency to a "mystical drift", expecially in the models that follow the Copenhagen interpretation of QM. These models are beyond, by definition, the experimental verification and are also placed beyond the falsification, since depart from the assumption that Consciousness resides in a domain not observable with the current technologies, such as the processes that occur below the Planck constant. To the criterion of falsifiability it should be added, however, a second criterion relating to the compatibility of the model with the typical characteristics of biological systems. So we reach the conclusion that all the proposed models of Consciousness in Quantum Mechanics can't be translated in experimental proposals because they are either incompatible with the criterion of falsifiability and / or incompatible with the characteristics of biological systems. The only acceptable models are those that combine Quantum Mechanics with special relativity. However, beyond the pragmatic aspects, the theoretical model proposed by Argonov seems to be an interesting scientific challenge once we have the technologies to uncover the possibilities offered by this point of view. Argonov, V. Y. (2012). Neural Correlate of Consciousness in a Single Electron: Radical Answer to" Quantum Theories of Consciousness". NeuroQuantology, 10(2). Hameroff, S. R. (1994). Quantum coherence in microtubules: A neural basis for emergent consciousness?. Journal of Consciousness Studies, 1(1), 91-118. Hameroff, S. R. (2006). The Entwined Mysteries of Anesthesia and ConsciousnessIs There a Common Underlying Mechanism?. The Journal of the American Society of Anesthesiologists, 105(2), 400-412. ISO 690. Hameroff, S., & Penrose, R. (1996). Orchestrated reduction of quantum coherence in brain microtubules: A model for consciousness. Mathematics and computers in simulation, 40(3-4), 453-480.